Library image #357: View of the river and Linville Gorge Wilderness. The United States Congress designated the Linville Gorge Wilderness (map) in 1964 and it now has a total of 11,651 acres. All of this wilderness is located in North Carolina and is managed by the Forest Service. Native Americans scalped explorers William Linville and his son in 1766, an unhappy ending for a family whose name is now associated with one of the most scenic river gorges in the eastern United States. From its headwaters high on Grandfather Mountain, the powerful Linville River patiently carves the rugged, steep-walled gorge that encloses it for approximately 12 miles. Within the gorge, the river drops a dramatic 2,000 feet before leveling out in the Catawba Valley. East of the gorge is Jonas Ridge; west is Linville Mountain. The gorge's rim extends 3,400 feet, compared to the river's average of 2,000 feet. Plant communities range from lichens and shrubs on the cliffs to laurel and rhododendron along the riverbanks. In some spots, the gorge shelters stands of virgin timber. Assorted odd rock formations along Jonas Ridge--Sitting Bear, Hawksbill, Table Rock, and the Chimneys--attract beginner, intermediate, and advanced rock climbers. With 39 miles of challenging trails, backpackers come to Linville Gorge in substantial numbers. If you want more solitude during your visit, go to the southern half of the Wilderness, south of Conley Cove Trail (1.35 miles) in the western portion and south of the Chimneys in the eastern portion. The rough northern section surrounding Brushy Ridge also receives few visitors. A large black bear population attracts hunters between late October and early January. 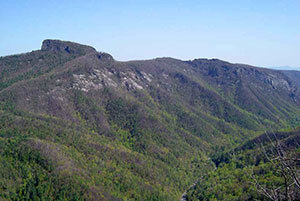 Planning to Visit the Linville Gorge Wilderness? How to follow the seven standard Leave No Trace principles differs in different parts of the country (desert vs. Rocky Mountains). Click on any of the principles listed below to learn more about how they apply in the Linville Gorge Wilderness.